This recipe is inspired by two of my favourites, fish fragrant aubergine and jiaozi dumplings. This isn't a classic recipe but a tasty combination. If you don't believe me give it a try you will be addicted. The dumplings are tasty with a nice spicy flavour. Tasty enough without needing any dipping sauce, but I still make a ginger spicy vinegar to go with. Unlike standard fish fragrant aubergine, i.e. deep frying the aubergine then braise in a spicy sauce with minced pork, these dumplings' filling used all the ingredients as in the standard fish fragrant aubergine recipe but method is different. Here is the recipe. This recipe will make about 50 - 55 dumplings. Can half or make1/3 if you want to make less. I can eat 10 dumplings in one go. Score the aubergine skin into fine thin strips. Remove stem and cut aubergine into quarters. Place on a steamer and steam on high heat for about 8 minutes or till just tender but not mushy soft. Leave to cool, drain off any liquid. Shred or roughly chop the aubergine. Put aubergine in a large mixing bowl, add in pork and the rest of the ingredients, except spring onion. Mix thoroughly together. Best mix by hand. Finally add spring onion, lightly mixed together. * Can also use plain flour or all purpose, I find bread flour dough is more elastic, easy to wrap and won't split during wrapping and steaming. Most of all I like the texture better. * I don't add salt to this dough because the filling is salty enough. You can add some salt if you want to. Add water slowly into flour, mix and gently knead till no more dry flour left. Amount of water needed depends on type of flour, use your own judgement. At this time the dough can be a bit lumpy. Don't worry. Cover and leave it to rest for about 15 - 20 minutes. Then knead till smooth. Rest for few minutes to relax the dough. Cut into 3 pieces. Roll each piece into a long sausage about 2 cm thick. Cut into small pieces about 8 - 9g each. You should get about 50 - 55 pieces of dough. If the dough sticks to the working surface dust with a little flour before cutting. Coat the small pieces with some dry flour. Cover with dry clean cloth to prevent drying. Take a piece of dough, roll it out very thin into a round disc about 5 - 6cm wide. Dust dough and rolling pin with flour is dough is sticky. Put the disk on your hand put on some filling. Fold over into a half moon but do not seal. Pinch the centre part of the folding edge together. Then start pleating. I normally pleat from centre to end on one half side then pleat the other half from centre to end again. Pleating is only on one side of the wrapper facing you or backside whichever way you pleat. One side pleated the other side is flat. By the time you finish pleating pinch the edge so it seal properly. Dust a tray or couple of plates with flour then place the dumplings on, do not let dumplings touch each other or they will stick together, cover with clean dry cloth prevent drying. Continue making the rest. You can wrap what you need. Cook and eat. Keep the remaining dough and filling in the fridge, wrap and cook with 1 - 2 days. Best cook and eat straight after wrapping. Make a dipping sauce by mixing about 2 - 3 tbsp finely shredded or grated ginger, 2 - 2.5 tbsp Chinking vinegar, 1 tbsp light soy sauce and about 2 tsp chilli oil. I like more ginger and I like them shredded more then grated. 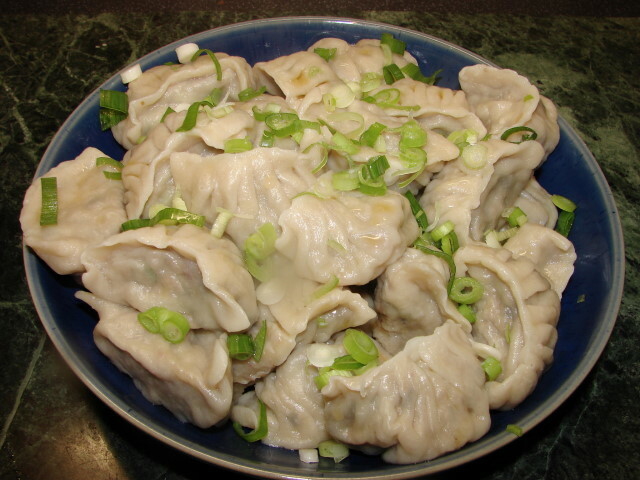 I finished wrapping the whole lot of the dumplings per this recipe, half of them I fried making pot stickers dumplings or wartip and the other half I simply boiled like normal jiaozi. One recipe two ways of eating. Add some oil to the pan. Heat till warm. Heat on low. 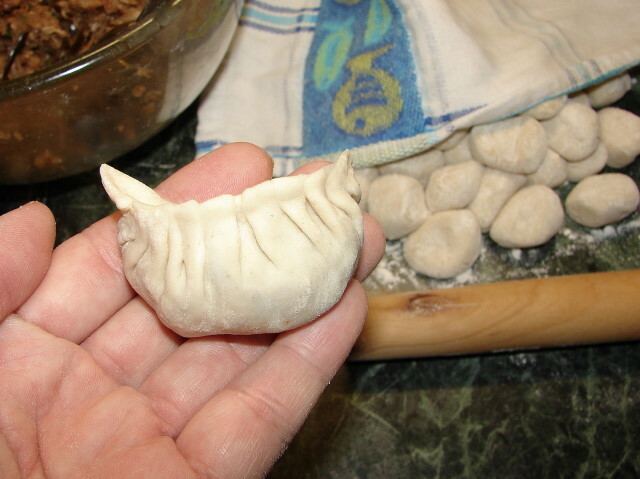 Then arrange dumplings anyway you like I like to arrange them circular like a flower pattern. Prettier to tip out when cooked. When done turn the heat up a notch. 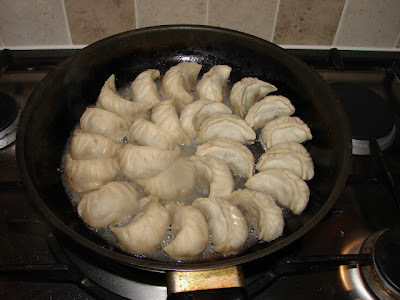 Fry till base of dumplings is light brown, check by take one or two out to check colour. Then add about 5 - 6 mm deep of water surrounding the dumplings. (If you use a 30cm pan like I did, you need about 1/2 cup water). Heat on medium high and cover with lid. Let the water boils with the lid on, the steam will cook the dumplings. When you can hear pan is lightly sizzling when all the water is boiling off. Remove the lid and let the dumplings fry a little longer till the base is golden and crisp. Now ready to remove onto serving plate. You may need a spatula to loosen the base of dumplings if the pan is not completely non stick. Place a plate on top of the dumplings then tip the pan upside down and all the dumpling will drop onto the plate with golden side facing up. Ready to eat. Best eaten while hot on their own, with dippinig sauce as suggested above or with light soy, chilli oil or sweet chilli sauce. Optional, for a better taste need some sesame oil and chopped spring onions to dress the dumplings after cooking. Sesame oil also helps to separate the dumplings. Boil a large pan/wok of water till rapidly boiling. 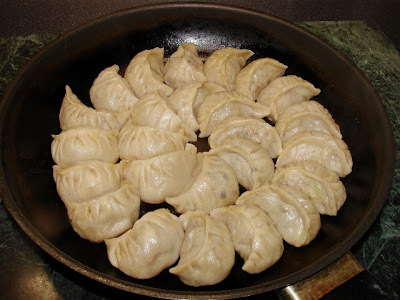 Continue on high heat, drop in the dumplings one by one, do not crowd the pan. 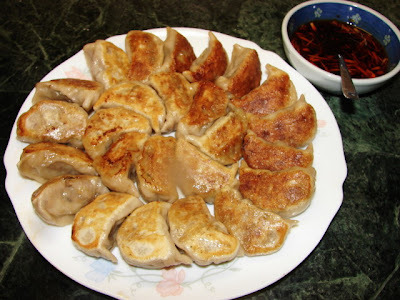 After about a minute or two, you may need to lift the dumplings with a spatula if they stick to the bottom of the pan. Continue boiling till all the dumpling floats onto the top. Then they are cooked. Remove and sprinkle on few drops of sesame oil and some chopped spring onion. Ready to eat with or without sauce. I like it with the ginger vinegar sauce as suggested on this recipe. You can use any dipping sauce you like. I am sorry about the quality of some of the pictures, not realizing I got too close to the steaming pan and the lens has a condensation spot affecting some of the final shots. These sound amazing. I think you've managed to create the ultimate dumpling! Sunflower these look really good. I can't say I would have the confidence to try myself...well one day perhaps! So I got inspired by this, and made some dumplings the other week to use up leftover boiled pork and fish-fragrant aubergine. I just chopped the pork and aubergine, and put them in dumplings. They were really good! I know this isn't quite the same as what you did (the pork in mine was pre-cooked, for a start), but your post was definitely the inspiration.